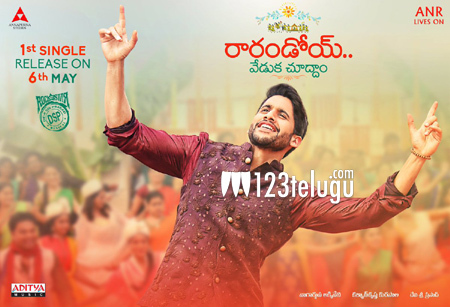 Akkineni Naga Chaitanya’s upcoming flick, Rarandoi Veduka Chuddam, has completed its shooting part and the post-production work is underway at the moment. The film has Rakul Preet Singh as the female lead. The latest update is that the first single of the film will be released this Saturday. Confirming this news, Nag on his official Twitter handle, posted, “The summer of love begins coming Saturday Ra Rando Veduka Chuddam first song on air Saturday the 6th/listen and love!!!”. Touted as a feel good family entertainer, the film is directed by SCN fame Kalyana Krishna. Akkineni Nagarjuna is producing RRVC under his Annapurna Studios banner, which is scheduled for May last week release. Rockstar DSP has composed the film’s music.